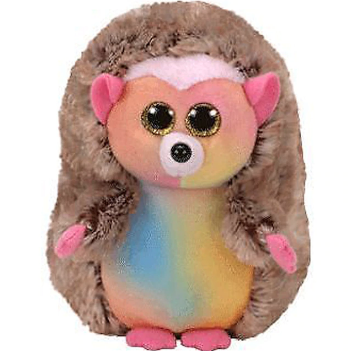 Pinecone is a pastel coloured, tie-dyed hedgehog with pink ears and pink hands and feet. She has large, glittery gold button eyes and a black button nose. She has a tiny patch of pale pink fluffy material on her forehead and her entire back is covered in brown fuzzy material for her spikes. We play in the woods roll and jump on the logs. Pinecone was released in February 2018. Her Birthday is on 16th February. Pinecone is a Walgreens exclusive Beanie Boo. There are two versions of Pinecone. This medium 9″ Beanie Boo Buddy and a small 6″ Beanie Boo.